Port Alberni RCMP Const. Chet Carroll kicks off the Canadian Mental Health Association’s Ride Don’t Hide. The annual bike ride benefits the Canadian Mental Health Association which supports individuals with mental health issues. 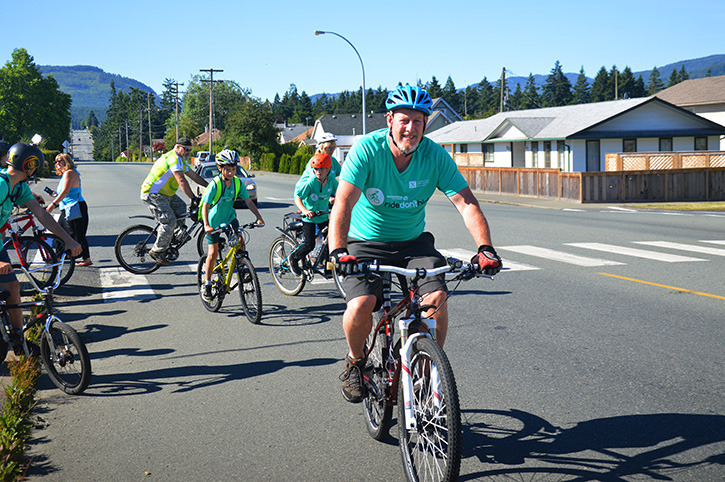 Dozens of Port Alberni residents came out for the Canadian Mental Health Association’s Ride Don’t Hide event on Sunday, June 26. The annual event started at the corner of Burde Street and 10th Avenue and had three options—four kilometres, eight kilometres and 32 kilometres. The ride raises money for the Port Alberni branch of the CMHA which provides support to individuals with mental health issues. The Port Alberni branch of the CMHA helps with housing, advocacy, peer support, outreach, permits for disabled parking and runs the New Horizons Clubhouse, the Food Matters program and the Healthy Harvest Farm on Beaver Creek Road.